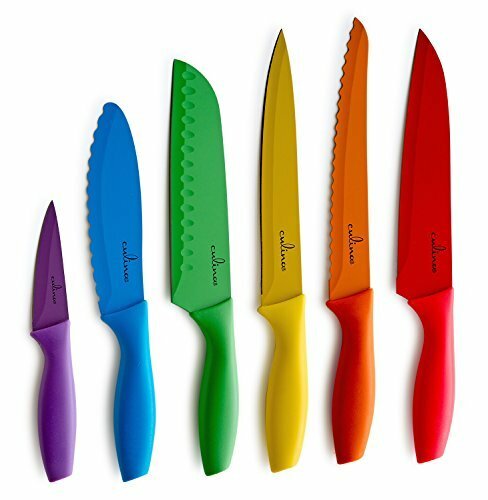 Culina® 6-piece Color Knives is an attractive collection, color-coded so each knife is used to carry a specific task. It's an excellent way to maintain food safety as it helps avoid cross contamination. The color coating shouldn't distract from the highly resistant stainless steel construction. The keen blades are engineered to deliver a sharp, no-nonsense cut. It is strongly recommended to keep this set out of children's reach. 6 professional quality knives for a targeted performance - Purple Paring Knife: 3.5" blade slices right through fruits and vegetables for a clean, even cut on small size, thick skinned or tender flesh produce - Blue Utility Knife: 6" generously scalloped sharp blade engineered for a no-nonsense, effortless cut. General purpose: sandwich, cheese, coarse skinned and large produce. - Yellow Carving and Slicing Knife: 8" elongated, straight edge, pointed tip blade makes for easy slicing and even quick de-boning. Suited to meat carving, great results with thick or thin slices. - Orange Bread Knife: 8" serrated blade allows ample freedom to slice whole loaves in one sharp cut. Large teeth slide right through crusty bread or soft loaf, even cakes: no shreds. - Red Chef Knife: 8" tapered, straight-edged, 2" wide blade suited to mincing, slicing, chopping. Multipurpose: provides a sharp, power cut including poultry, fish and small bones. - Green Santoku Knife: 7.5" hollow-ground edge, razor-sharp blade. Adapted to a wide range of tasks from a swift cut of thick red meat to an assertive garlic crush. 2" wide for easy chopping, dicing and scooping. EXTREMELY SHARP. KEEP KNIVES OUT OF CHILDREN'S REACH. Protective Sheath matching color to protect and securely store each knife after use.